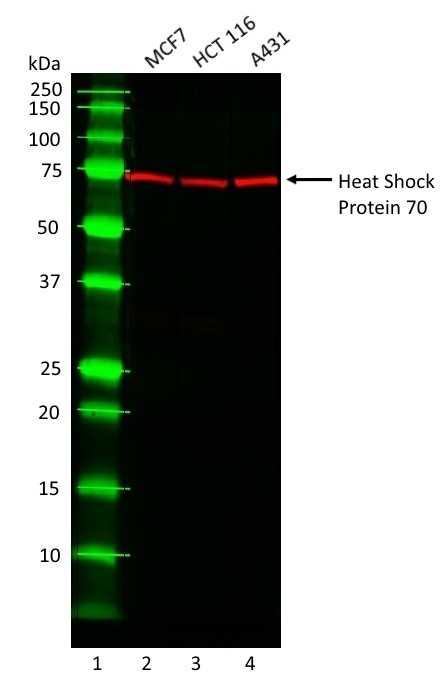 Western blot analysis of whole cell lysates probed with Mouse anti heat shock protein 70, clone C92F3A-5 (MCA6096) at 1/1000. Detection was performed using HRP conjugated Goat anti Mouse IgG (H+L) (STAR207P) at 1/10 000 and visualized using the ChemiDoc MP Imaging System. 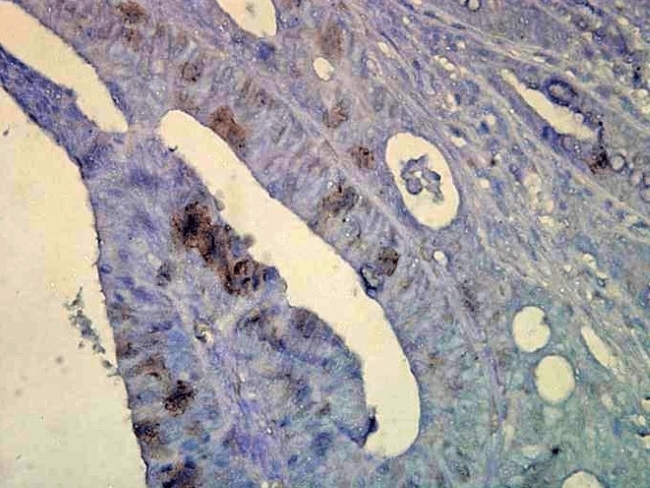 Immunohistochemistry analysis of formalin fixed, Mouse colon carcinoma stained with Mouse anti heat shock protein 70 antibody (MCA6096) at 1/10 000. Mayer’s Hematoxylin (purple/blue) was used as a nuclear counterstain. 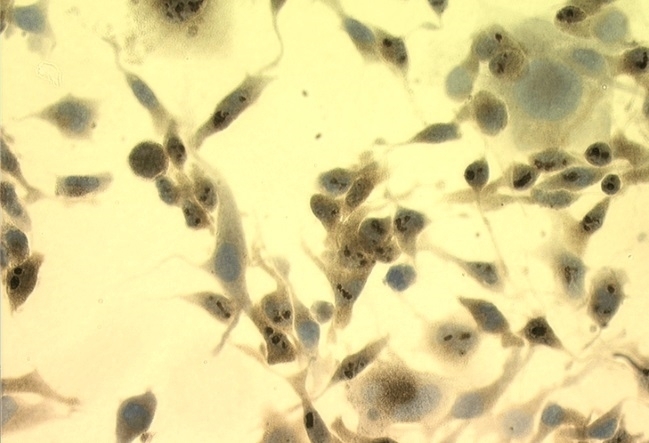 Immunocytochemistry analysis of formalin fixed, heat shocked Mouse melanoma cells using Mouse anti heat shock protein 70 antibody (MCA6096) at 1/1000. 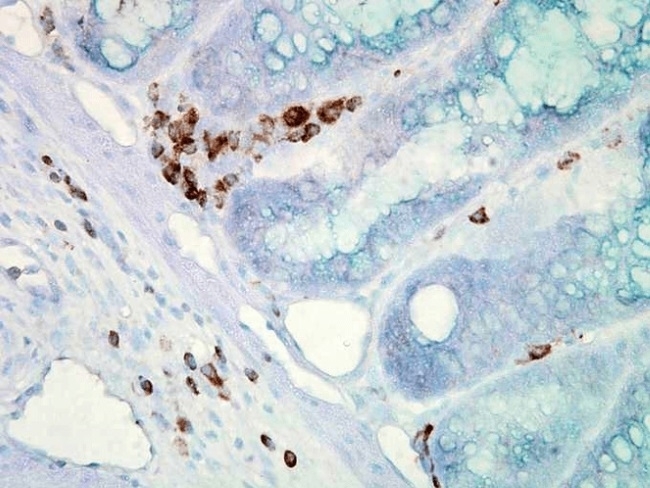 Immunohistochemistry analysis of formalin fixed Human colon carcinoma using Mouse anti heat shock protein 70 antibody (MCA6096) at 1/10 000. Mayer’s Hematoxylin (purple/blue) was used as a nuclear counterstain. Mouse anti heat shock protein 70 antibody, clone C92F3A-5 recognizes human heat shock protein 70 (HSP70), a member of the highly related HSP70 family, which range in size from 66-78kDa. Heat shock proteins are a group of heat- or stress-inducible proteins which act as molecular chaperones and as essential regulators of cellular processes, including protein folding. HSP70 acts alongside other chaperones to mediate the folding of newly-synthesized peptide sequences, stabilize proteins against aggregation, and assist in protein transmembrane transport. This antibody does not cross-react with HSC70 (HSP73).